Are you ready for a romp in the days of old? 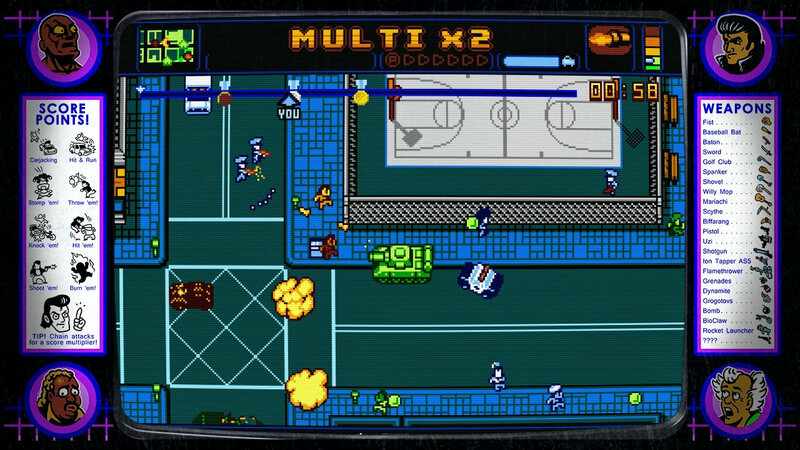 Maybe Retro City Rampage is just what you’re looking for. Being a spoof the NES era of gaming, this game provides a very humorous open-world adventure for you to explore. 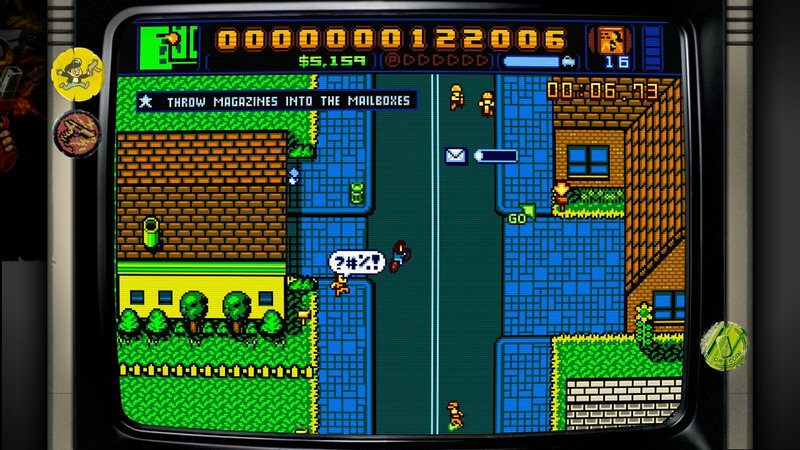 Think classic Grand Theft Auto in 8-bit and you pretty have the idea of what this game is all about. The story is based around 80’s pop culture with references to some of our all-time favorite classic NES titles and movies from the days of big hair. I laughed out loud many times while playing the storyline of this game. It was a real treat. The graphics are what you would expect from a quality 8-bit game. I was really amazed at how great they looked. I played most of the game on the Vita and everything was crisp and easy to see. They even kept all of the classic 8-bit colors, which makes it look very authentic. There are also several different display features that you can use to makes the game look as if it were on various other classic consoles. Some of the features you can choose from are Arcade Cabinet, UHF, Laser Tube and Super Video Brick. These are really nice to try out and play around with; it really is a trip down memory lane. There are color modes to chose from as well. Hearing the bleeps and blops of old really takes you back to those days. The 8-bit chip tunes are very nice as well; they even have different radio stations full of their own tunes just like in Grand Theft Auto. The sound effects fit the 8-bit mood very nicely and make it feel like a classic experience to be certain. I really loved the way the developers put thought into all these things as they created this game. The gameplay is where this game really shines, being mostly top-down like the original Grand Theft Auto games. Sometimes it switches things up and gives you side scrolling for certain missions. 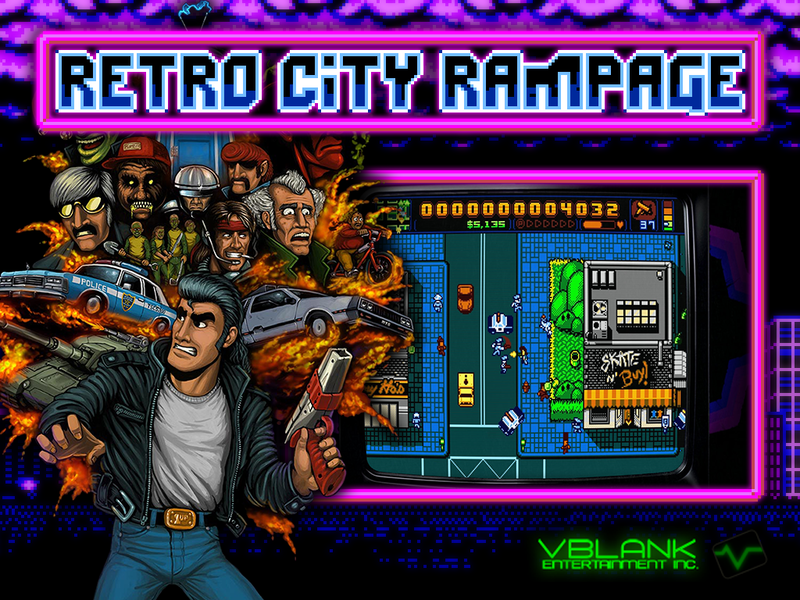 You romp around this 8-bit city jacking cars, collecting weapons, and taking on various missions along the way. You can have a blast just running around seeing how much mayhem you can cause. Much like other games of this type, you have a wanted level. The higher it goes, the more crazy stuff they send out after you. The variety of weapons in this game is just astounding. From a sword and shield Zelda spoof to The Ghostbusters Proton Packs there are a ton of things to cause damage with. There quite a few secret things to find hidden within this open world as well, such as cheat codes and hidden character skins. If you use a cheat code both saving and trophies will be disabled, so you will not want to use these unless you are just playing around in the open world. The only real problem I found with the game is that the controls can be a bit stiff and the difficulty can skyrocket from mission to mission. One mission in particular I struggled with for about 2 hours. Thankfully there is a retry option that just starts the mission from the front, rather than having to start at the beginning and go all the way back to wherever you were. These are only minor problems and do not take away from the overall experience of the game. The cross-save feature is very nice as well. This game is a cross-buy game; when you purchase it off the PSN you receive both the Vita and PS3 versions of the game. The cross-save feature lets you move your same save file back and forth between the console. Play at home, drop your save on the Vita and then take it on the go. 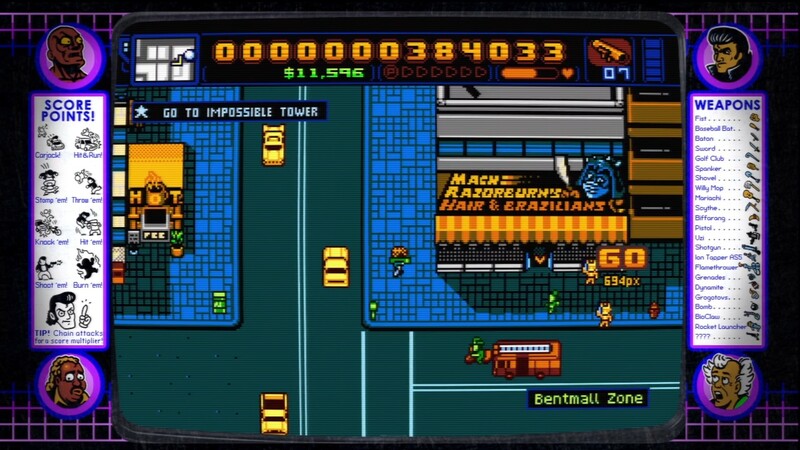 I really enjoyed Retro City Rampage from start to finish. Its humor and style make it shine above lots of other games I have seen lately. You can spend a lot of time in the open world just exploring it to see all it has to offer. The story missions are well thought-out and go well with the over-the-top story that is represented here. The amount of secrets to find and unlock will keep you playing for hours on end and for its price you get more than enough bang for your buck. I cannot wait to see what else this studio brings us down the line. On a side note, if you are a PlayStation Plus subscriber you can pick this up for free; so what are you waiting for?